August 2016 - Certificate of Occupancy granted for our new lab space. We are moving in! Phase 1 construction essentially complete. August 2016 - Emily Carlson wins the prestigious Provost's Family Graduate Fellowship. August 3, 2016 - Associate Professor Tom Vandervelde has been elevated to the rank of IEEE senior member. June 2016 - After spending a year in France on her STEM Chateaubriand Fellowship, Abbey Licht accepted a prestigious Epitxial Internship at MIT-Lincoln Lab. We congratulate her, but look forward to her returning to the lab this fall. We miss you Abbey! May 2016 - Prof. Vandervelde gives invited talk at the Interagency Advanced Power Group (IAPG) Mechanical Working Group meeting in Adelphi Maryland. May, 2016 - Graduate Student Emily Carlson Joins REAP Labs! April 2016 - Profs. Vandervelde and Panetta awarded NSF grant entitled, "FAST-TRAC: Identifying and Overcoming Barriers to Advanced Degree Attainment for Low Income Engineering Students"
February 2016 - Construction begins on REAP Labs new space at 200 Boston Ave. This space will also house the new Tufts Epitaxial Core (TEC) Facility. December 2015 - Nicole wins Graduate Student Research Competition. September 2015 - Nicole and Maggie present at EUPVSEC in Hamburg, Germany. September 2015 - Nicole successfully defends Master's thesis. 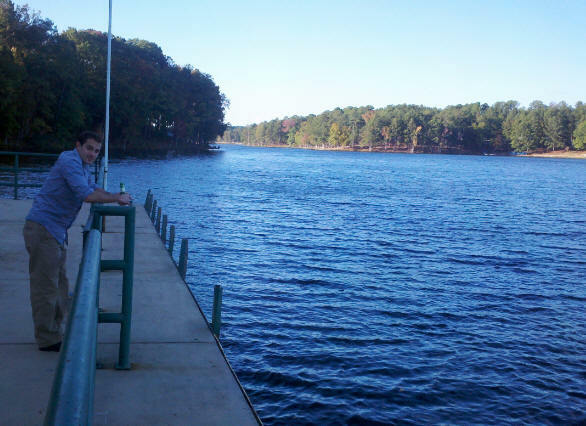 August 6, 2015: DeMeo Wins IC Postdoc Fellowship Dante DeMeo, E08, EG13, has received an Intelligence Community postdoctoral research fellowship from Oak Ridge Institute for Science and Education (ORISE) managed by the U.S. Department of Energy for Oak Ridge Associated Universities (ORAU). Dante and advisor Associate Professor Tom Vandervelde will act as Dante's research advisor in the Renewable Energy and Applied Photonics (REAP) Lab. June 19, 2015: Corey Shemelya wins Joseph Noonan Outstanding Doctoral Research Prize Corey Shemelya, EG13, has been selected as the 2015 recipient of the Joseph Noonan Doctoral Research Prize. The prize recognizes outstanding research contributions made during doctoral studies in the department of electrical and computer engineering at Tufts University in the past three years. Corey is currently an Intelligence Community Fellow and Research Assistant professor at the University of Texas at El Paso. June 16, 2015: Vandervelde Wins $2M in Green Energy Grants In 2014, Associate Professor Tom Vandervelde received a $1.5M Major Research Instrumentation grant from the National Science Foundation to build a multi-chamber molecular beam epitaxy (MBE) system to generate advanced semiconductors. He recently received $1M over four years from the Office of Naval Research for his proposal entitled "Epitaxial Growth of Semiconductor-Semimetal Towards Rectifying Diodes for Energy Harvesting and Indirect Solar Thermal Energy Conversion". He received an additional $600K from the Air Force Office of Scientific Research (AFOSR) to fund research in producing Group-IV SiGeSn photonic materials. Vandervelde also received a $620K Defense University Research Instrumentation Program (DURIP) award which to support his VG90 MBE renovations associated with his photonic material research. May 22, 2015: Vandervelde Wins Tufts Collaborates Grant Associate Professor Tom Vandervelde and Assistant Professor James Adler (Mathematics), received a grant from the Tufts Collaborates program for their proposal "Unlocking the Mystery of Ultra-Efficient Solar Cells." May 6, 2015: Licht named STEM Chateaubriand Fellow Doctoral candidate Abigail Licht, ECE, was named a 2015-2016 STEM Chateaubriand Fellow. The Chateaubriand Fellowship is a grant offered by the Embassy of France in the United States. Every year, it allows doctoral students enrolled in American universities to conduct research in France for 4 to 9 months. Congratulations, Abigail! April 9, 2015: Stevens Named NASA Space Technology Research Fellow Maggie Stevens, a doctoral student in Associate Professor Tom Vandervelde's REAP Lab, received funding from NASA for her proposal "Solid State Energy Conversion for Deep Space Power." NASA Space Technology Research Fellowships are awarded to graduate students who show significant potential to contribute to NASA's goal of creating innovative new space technologies for the United States' science, exploration and economic future. Congratulations, Maggie! March 25, 2015: Graduate student Nicole Pfiester-Latham was selected to receive the 2015 School of Engineering, Outstanding Graduate Contributor to Engineering Education Award. The award recognizes Pfiester-Latham for her significant contributions to the education programs of the department. Nicole received the award at the 17th annual Graduate Student Awards ceremony held April 24, 4-6 p.m. in Distler Performance Hall. March 5, 2015: Graduate student Maggie Stevens and undergraduate Katie Levinson in Associate Professor Tom Vandervelde's REAP Lab presented papers at the American Physical Society meeting, March 2-6, 2015 in San Antonio, Texas. Maggie presented a paper on "Studying Anomalous Open-Circuit Voltage Drop-Out in Concentrated Photovoltaics Using Computational Numerical Analysis." Katie presented a paper on "Emission Testing Results of Thermally Stable, Metamaterial, Selective-Emitters for Thermophotovoltaics." February 22, 2015: Stevens Named NREIP Scholar Maggie Stevens, a doctoral student in Associate Professor Tom Vandervelde's REAP Lab, received funding to spend the summer working at the Naval Research Labs through the prestigious Naval Research Enterprise Internship Program. She will be working with the Robert Walters group at NRL on epitaxial processes and characterization. Congratulations, Maggie! August, 2014: Prof. Vandervelde awarded new NSF grant to mentor and advise future female engineering leaders. July, 2014: Chandler Downs successfully defends his Doctoral Thesis. July, 2014: Prof. Vandervelde awarded NSF REU Suppliment to his CAREER award for summer 2014 and 2015. This funding will pay for undergrads to work in REAP Labs on this important project. July, 2014: Maggie Stevens officially joins REAP Labs as a graduate student researcher. May, 2014: Prof. Vandervelde was officially awarded tenure and promoted to the rank of Associate Professor by the Tufts University Board of Trustees. April, 2014: Nicole Pfiester Latham receives a Special Mention for Outstanding Graduate Student Contribution to Undergraduate Education. March, 2014: Tom Vandervelde receives Tufts University School of Engineering Faculty Mentoring Award for a Second Time (2011 Winner). March, 2014: Norihito Naka awarded as a Tufts Summer Scholar. February, 2014: Chandler Downs, Abigail Licht, and Nicole Pfiester Latham present at Photonics West 2014. December, 2013: Abigail Licht invited to submit a featured paper in the Journal of Materials Research. December, 2013: Abigail Licht's Fall MRS 2013 paper selected as an outstanding paper. December, 2013: Abigail Licht, Corey Shemelya and Nicole Pfiester Latham present at MRS 2013, Boston, MA. December, 2013: Acera School visits REAP Labs (ECE News). October, 2013: Abigail Licht and Nicole Pfiester Latham granted a Travel Award for NAMBE 2013. October, 2013: Abigail Licht and Nicole Pfiester Latham present at NAMBE 2013, Banff, Canada. September, 2013: Dante DeMeo and Nicole Pfiester Latham present at EUPVSEC 2013, Paris, France. April, 2013: Abbey Licht recievews GROW fellowship to spend the summer in Montpellier, France at the nanoMIR lab under Jean-Baptiste Rodriguez. March, 2013: Robert Rockmore awarded as a Tufts Summer Scholar. Oct., 2012: Corey Shemelya and Dante DeMeo featured in "Sustainable Brands"
Sept. 2012: Joint Reap Labs and Fraunhofer IAF work wins best paper award. Aug. 2012: Welcome Nicole Pfiester-Latham to REAP Labs! March, 2012: Abbey Licht is accepted to the Tufts University Sustainability Council. February/March, 2012: Members of REAP Labs present at APS at the South Boston Convention Center. 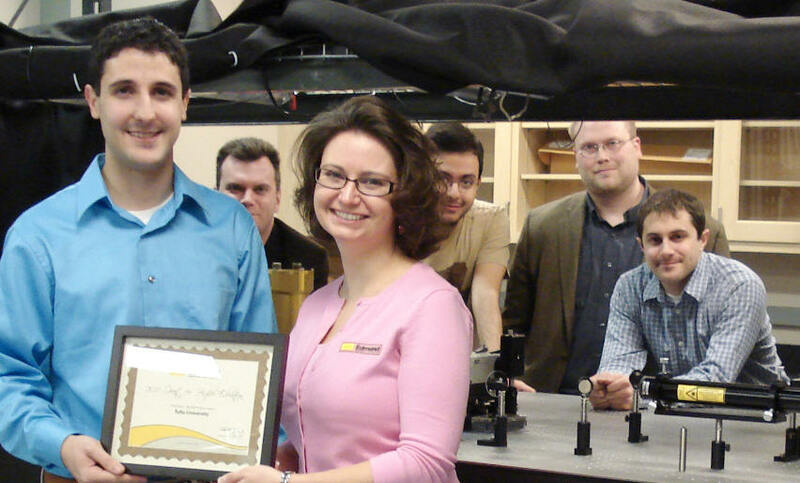 December, 2011: Dante DeMeo and Sam MacNaughton (from Tufts NanoLabs) present at ISDRS at the University of Maryland. September, 2011: Abbey Licht is accepted as a Tufts University Eco-Ambassador. 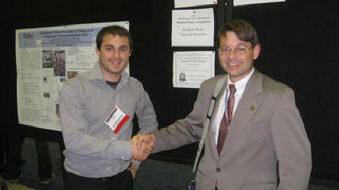 June, 2011: Members of Reap Labs present at PVSC37 in Seattle, WA and EMC in Santa Barbara, CA. Here we are at the Space Needle! We also made it into the daily update at PVSC. June, 2011: Abigail Licht joins REAP Labs! 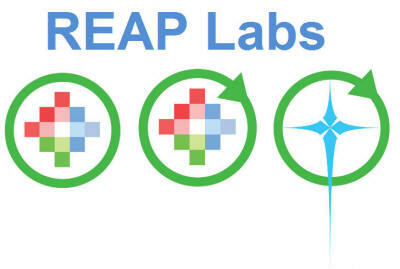 September, 2008: Chandler Downs, John Chivers, Dante DeMeo and Corey Shemelya join REAP Labs.